PULZAR LONG LIFE GOLD is truly exceptional motor oil that exceeds the stringent performance requirements of the API CH-4 classification. It provides excellent quality in both on- and off-highway applications and in diesel engines. It contains PULZAR’s advanced Modified Release Technology (MRT) for long lasting engine protection. MRT continuously protects engines at a wide temperature range through the oil service life. PULZAR LONG LIFE GOLD MOTOR OIL is specially formulated to resist shear down, viscosity loss and thickening from heavy soot load and oxidation, even under extreme circumstances, such as extended oil drains of up to twice the normal interval. It has been tested for many hours and miles under the harshest conditions imaginable. It is formulated to be tough enough, strong enough and durable enough to handle the way you manage your fleet. Newly designed diesel engines emit significantly less nitrogen oxides (NOX) emissions. As a result, they generate more soot in the crankcase. Soot, if uncontrolled, can cause considerable damage. Over time, soot particles can agglomerate, making larger particles that cause oil to thicken, restricting oil flow, reducing fuel economy, damaging moving parts and thus shortening engine life. PULZAR LONG LIFE GOLD MOTOR OIL provides outstanding soot control and helps extend engine life by protecting it against brutal wear and tear. PULZAR LONG LIFE GOLD is formulated with high-quality base stocks and superior additives. It maintains viscosity under high-temperature, high-stress conditions and protects moving parts from friction, wear and engine-destroying metal-to-metal contact. PULZAR LONG LIFE GOLD has outstanding resistance to “shearing out” of viscosity grade, so it can continue to provide the oil film and wear protection, even after extended drain intervals. PULZAR LONG LIFE GOLD MOTOR OIL SAE 15W-40 meets or exceeds the performance requirements of the followings diesel engine manufacturers: Mercedes-Benz, Cummins, MAN, MTU, Mack, Renault Truck and Volvo as well as others. PULZAR LONG LIFE GOLD MOTOR OIL is recommended wherever engine manufacturers specify the use of an engine oil meeting API Service Classification CH-4, CF-4, CF-2, CF and SJ or any combination such as CF/SF, CF-4/SG, CG-4/SJ or CH-4/SJ. 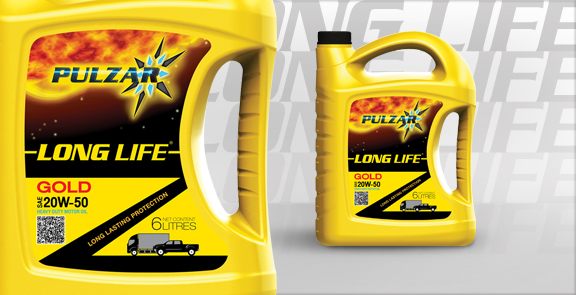 PULZAR LONG LIFE GOLD MOTOR OIL is available in multi-grade SAE 15W-40 and SAE 20W-50. Both SAE grades exceed the requirements of API CH-4, CG-4, CF-4, CF, CF-2/SJ performance categories. Always refer to the vehicle owner’s manual for the correct viscosity choice. SAE 15W-40 exceeds ACEA E2-96, MB 228.1, MAN 271, VOLVO VDS-2, MTU Oil TYPE 1, MACK EO-M Plus, Renault Truck RD/RD-2, CUMMINS CES 20076 and CAT ECF-1a.